It has one of the universal symbol of Love - The Eiffel Tower . It is said that unofficially hundreds if not thousands proposed at Eiffel Tower every week! I had alway wanted to visit Paris. Not because I wanted to propose but rather I wanted to experience the City of Love with my other half. Thus when French Faire opens on May 12th till 22 June at Gardens By The Bay, I just had to see the French themed floral display. French Faire is part of 'Gardens by the Bay Goes around thhe World ' floral displays for the flower dome. After being wow by the majestic 'War of Roses ' and the colourful 'Tulipmania' , we are all ready to indulge in a little love at the Flower Dome. Ever since the Flower Dome opens its doors 2 years ago, we had always been to the Gardens during the day. So for this trip , we decided to do in the evening. After all it is more romantic to take a walk under the stars than the hot blazing sun. The centerpiece for French Faire would undoubtably be the Effiel Tower. Unlike the previous 2 showcase, the floral display is centralized at the main flower bed. In addition, the outer ring on the flower bed is now closed off. 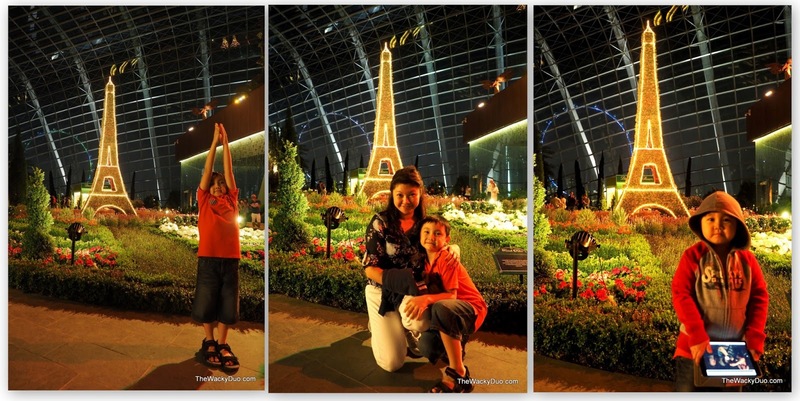 It was a different experience visiting the flower dome at night. We do notice other installations such as the kaleidoscope located at the mezzanine level of the Flower Dome. The Horticulture centerpiece, the Eiffel Tower looks amazingly similar to the real deal at night. Lighted and standing tall in the middle of the Flower field,it shares the same skyline as Singapore iconic Singapore Flyer. It's like Paris in Singapore. Not only does the Eiffel Tower dazzle, the sweet scent of lilac, lavender, jasmine and gardenia filled the Perfumed Flower Dome . Not only it smells good, it looks beautiful too. Honestly taking photos of flowers at night is challenging especially if you have to work with the existing lightings in the Flower Dome. You may consider taking a tripod for that. As for taking photos with children, you need a fast lens otherwise it may just turn out blurry. At night, it is hard to see the colourful flower field clearly. To have a view of what it looks like during daytime, do head down to Dejiki.com for his beautiful daytime photos. Despite the dark, it does not stop Big C from practicing his photographic skills. Beside the Eiffel Tower and the floral display, there are also two shops set up in the Flower Dome. Choose between having a cuppa or a visit to the florist. Unfortunately these are just props that goes with the French Faire theme. However we do think the experience could be enchance if people are allowed to have a cuppa within the Flower Dome. Just imagine sipping your hot brew coffee under the cool breeze with the Eiffel Tower as your view. Simply breathtaking I would imagine. Along the Flower bed are some paintings of France and Flowers. No doubt inspired by the great French Impressionist painter , Claud Monet. By now you would probably be wondering. How did the Wackies get to visit the latest floral display everytime? Well we do have a 'Friends of the Garden' family pass. 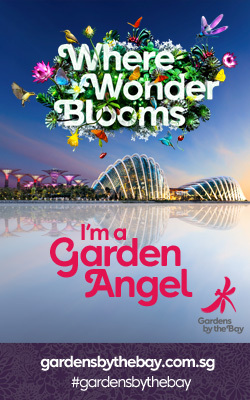 It gives us unlimited admission to the Flower Dome, Cloud Forest and OCBC skyway with additional perks such as free parking and discounts. Given that it normally cost $80 for a family of 4 ( 2 adults and 2 children) for one visit to all three attractions per trip, the $180 family pass (2 adults and up to 3 children) makes it worthwhile with unlimited entries per year. With an almost guaranteed different Flower Dome experience every other month, this might be a good deal to consider. Alternatively look put for GBTB promotions such as a family package for 4 at $50 for both conservatories . Promotion ends on 30 June ( for local residents only) . So is this a 'must go' event? If you want a taste of Paris and to take a photo of yourself under the Eiffel Tower, it will be worth a trip. Definitely much more cost effective than a round trip to France. Even The Little Brick Man could not resist a visit . Celebrate French Faire with a performance featuring a repertoire of all things French! French songs, chansons and operas! Bring along your picnic mats and enjoy the outdoor screening of The Day of the Crows / Le Jour des Corneilles, a French animated movie. Do pick up a copy of the Garden Trail : A French Spring as you explore the French inspired garden at the Flower Field . Learn about the well loved flowers of France like the Jasmine and Lavender . Find out more about their significance and uses in hoe Garden Trail. And if you time, do take a slow walk around the Gardens at night. It's a peaceful and tranquil walk that would soothe most. Sometimes it might just be the antidote you need after a hard day's work. Who knows it may even inspire you to feel A'mour and propose with Des Fleurs with the words 'Je t'aime' under the Supertrees?